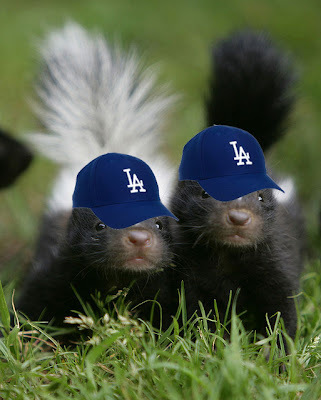 In 2013 a skunk, possibly a family of skunks, made their presence known at the Dodger Stadium. I originally wrote a bit about that here. They were initially found in the stands in early June of that year, and now, nearly two years later, they have made their glorious return. Per various tweets, a skunk has made his/her way to the Cardinals dugout, and is currently camping underneath the photog area. Apparently, it is refusing to leave. As you might recall, the day that skunk first showed up at Dodger Stadium was on the same day Yasiel Puig made his debut as a Dodger. Seemingly, out of the Blue, the Dodgers immediately went on an fantastic tear with Puig as their new offensive leader. Now, the skunk has returned and standing in left field this evening will be rookie Scott Schebler to make his Major League debut as a Dodger. The mighty Dodger Skunk has come back to send his well wishes to the newest Dodger prospect, and if the past is any indicator of future events then we should be on the cusp of witnessing the emergence of our next great star. Welcome to the Blue, Scott Schebler! The Los Angeles Dodgers today recalled outfielder Scott Schebler (#55) from Triple-A Oklahoma City and optioned left-handed reliever Daniel Coulombe to Triple-A. Schebler, 24, will make his Major League debut tonight, batting seventh in left field, and has a .274 career batting average with 80 home runs and 305 RBI in 521 games in six minor league seasons. With Triple-A Oklahoma City this year, he's appeared at all three outfield positions and is batting .216 with six homers and 15 RBI in 49 games. 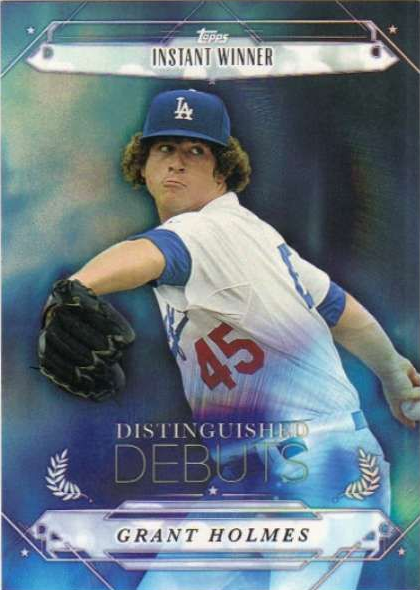 Schebler, who was honored as the Dodgers' 2013 Branch Rickey Minor League Player of the Year, was selected by Los Angeles in the 26th round of the 2010 First-Year Player Draft out of Des Moines Area (Iowa) Community College. Via Jeff Johnson at The Gazette, "C.R. 's Schebler gets call to the major leagues." His hometown newspaper in Cedar Rapids, IA. Via Jon Weisman at Dodger Insider, "Scott Schebler called up for MLB debut." Jon includes a feature written about Schebler that was originally printed in the current issue of Dodger Insider Magazine. Via David Hood at True Blue LA, "Dodgers top prospects 2015: Scott Schebler, No. 6." What makes Schebler a top prospect in the Dodgers system is his bat. Schebler has 60 or better grades on both his hit and power tool and has the potential to be a .285 hitter with 20+ home runs at the major league level. Schebler’s swing is geared to hit the ball with authority. He uses a long stride and significant weight transfer to incorporate his lower half into his swing. His swing plane is designed to produce loft on the ball and he has the power to carry mishits out of the park as well. And here's a video scouting report on Schebler from Bernie Pleskoff of MLBPipeline.com (8/8/2014). 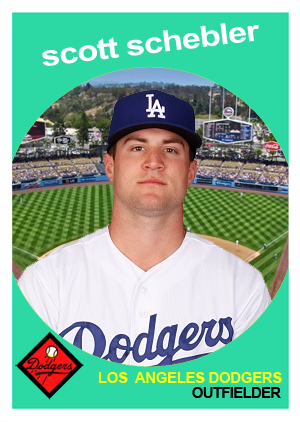 In celebration of Schebler's arrival to the Dodgers I made the above fantasy card for him. I used a Getty Images photo/Jason Wise and the 1959 Topps Baseball card design. Here is a glimpse at all of the Dodger prospect insert cards found within packs of 2015 Topps Pro Debut. Unfortunately, there are no autograph cards available... But there is a cool looking mascot patch card of Oggie the Raptor. So, there's that. Go here to see my past post on this set. The toast of the town, Joc Pederson, is captured in the photo above signing autographs for adoring fans prior to the start of yesterdays game. Pic above via Jon SooHoo/LA Dodgers 2015. Go here to check out more photos taken by Jon from Thursday's game. My fantasy team could really use a healthy Puig right now. Via George Alfano at MLB.com, "Puig gets two hits, hopes to return this weekend." "I thought he looked great, and the hamstring looks good," Rancho Cucamonga manager Bill Haselman said. "He ran great. With a pulled muscle, the body eventually heals itself." "I'm not 100 percent now, but it felt comfortable," said Puig, who is in his third season with the Dodgers and has a career batting average of .304. "I did my job, did my rehab in Arizona and I'll come back here [to Lancaster] tomorrow night." Via Eric Stephen at True Blue LA, "Grant Holmes, J.D. Underwood, Michael Ahmed named Midwest League All-Stars." Via Steve Adams at MLB Trade Rumors, "David Aardsma Opts Out Of Dodgers Contract." This is too bad, he could've been a nice piece out of the pen. The 33-year-old Aardsma has pitched quite well for L.A.’s Triple-A affiliate in Oklahoma City, working to an excellent 2.41 ERA with 11.1 K/9, 3.4 BB/9 and 15 saves in 18 2/3 innings. Aardsma recently explained to The Oklahoman’s Jacob Unruh that his offseason work in a strengthening program called Top Velocity helped him add a couple of ticks back to his fastball, which is now regularly sitting in the 91-93 mph range. Here's great news. Via Jon Weisman at Dodger Insider, "Kenley Jansen cleared to pitch tonight (Thursday)." Via Ken Gurnick at MLB.com, "Altitude triggers high blood pressure in Jansen." 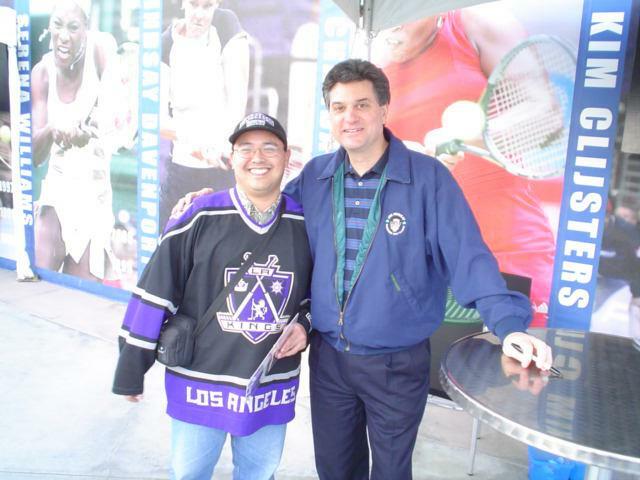 I would like to extend a hearty congratulations to LA Kings broadcaster Nick Nickson for being selected as the Hockey Hall of Fame 2015 Foster Hewitt Memorial Award winner. This award celebrates "members of the radio and television industry who made outstanding contributions to their profession and the game during their career in hockey broadcasting." This is the highest honor a hockey broadcaster can receive - like winning the Ford Frick Award for Baseball broadcasters. Jon Rosen at LA Kings Insider shares a recent interview with him here.